There are so many things to do while getting ready for your little bundle of joy. Why not relieve some of the stress by sitting down with a nice cup of tea and stitching up one of these free baby themed cross stitch patterns. These patterns are also great for baby showers and baby gifts. Create a unique gift for the new addition. Add the designs to a baby romper, burp cloth, or blanket. Create a Cross Stitch card or a wide variety of Cross Stitch projects with these designs. For more free baby-themed Cross Stitch patterns see Free Baby-Themed Patterns from Various Websites. Stitch the alphabet patterns individually or collect them all for a larger project. Use this free baby alphabet pattern to chart designs for a special baby gift. Choose from four color schemes or select your own colors. 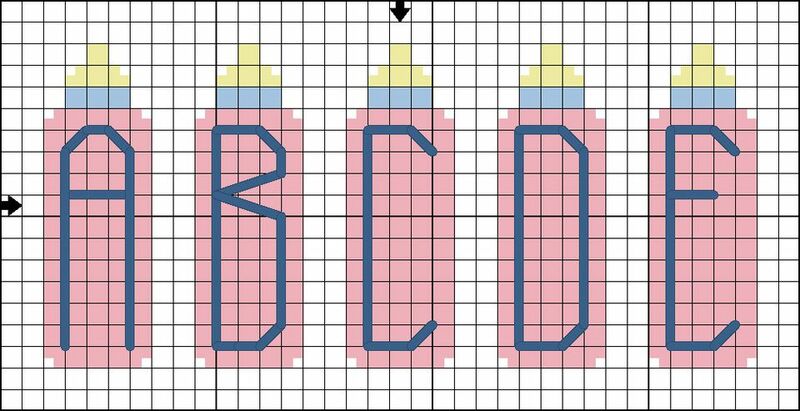 Stitch this free Baby Bottle Cross Stitch pattern for a birth announcement, baby gift, or card. Add this butterfly to a t-shirt or tote. Stitch these free Baby Rattle Motifs for a special gift for someone who has a new baby to celebrate. Stitch this popular chart in pastel colors for a baby bib or blanket. Stitch the cheery free Butterfly Blessing to display in a child's room. Add a small duck to a onesie or sampler. A sunny design for a diaper bag or baby wipe holder. Stitch this motif as shown or add the optional happy face back stitch. This would also look great in a nursery or on a hat or bathing suit. Stitch the free It's a Boy Baby Rattle Cross Stitch pattern for a special gift for a friend or relative with a new addition to the family. Stitch the free It's a Girl Baby Rattle Cross Stitch pattern for a banner or card to celebrate a new addition to your family or that of a friends. You can change the color and make the pattern gender neutral. You can also have the pattern fit the theme of the baby's room. A little lady bug for your little bug! This adorable pattern would look so cute on a summer play set or hat. You could stitch up a bunch of them on little diaper covers. Check out other animal motifs from this website for inspiration. Need a quick gift for a baby shower? Use the free Quiet, Baby is Sleeping Cross Stitch pattern to create a simple door hanger. Personalize the design or keep a universal baby gift on hand. This is a great gift for those pesky solicitors. Tell them that the baby is sleeping and they need to be on their way. Who is ready for a good night's sleep? The baby? I don't think so! They are ready to party the night away. Maybe this little sleeping moon will push them over the edge to sleepy town. The Sleepy Moon chart would look cute on a sleeper or baby hat or pajamas. Do you have a little bathing beauty? Why not stitch them this adorable little starfish pattern. A little starfish would look so cute on a sunhat for a tiny beach goer. This is perfect for your little water baby. Make sure you bring the sunscreen! Whether you are expecting or making a special something for a mother or father to be, these free baby themed cross stitch patterns are perfect to welcoming the newest addition. You can use the patterns not just for human babies but also the four legged ones. Welcome to the new world little baby!